There a couple of reasons for leaky cloth diapers: the diapers are repelling because they need to be stripped or possibly because the diapers fit poorly. If the diaper is too big, the gussets around the legs are too large. The stuffing in diapers is designed to absorb fluid quickly. But the fluff on the inside can’t keep fluid from running out of a leg hole that is too large. 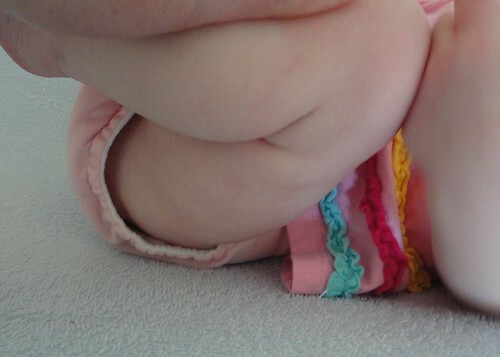 Also if the diaper is too large, the waistband won’t be tight enough to form a good, solid seal. Without this good seal, urine can wick onto clothes. If the diaper is too small, the leg gussets are too tight. This can create red marks on the baby’s legs and that doesn’t make a Mama happy. A too-small diaper also creates a problem in that you can’t add any additional stuffing to the middle for absorbency. If you start to add extra inserts or prefolds, you won’t be able to snap or velcro the diaper closed. Cloth diapers are just like paper diapers in that you have to move up in size in order to increase the amount of absorbency. When a diaper is too small, the baby will wet out of it almost every time. This is a great example of elastic that needs repair. When the elastic in a diaper is shot, it leaves gaping leg holes and the gusset is totally inefficient. You can see that the poorly fitting elastic lets the liquid just run right out of the diaper. And this creates an enormous mess. Even if the diaper is the right size for the baby, shot elastic will cause leaks every time. If you need help in repairing your diaper’s elastic, I’ve written a detailed tutorial to replace them. This method of replacing elastic does not require a sewing machine. You do have to be able to thread a needle a do a basic stitch, but it won’t tax your crafty skills much more than that. If you are able to find Lastin, it will hold up longer. However, I’ve replaced most of our diapers with the regular elastic you find at Wal-Mart and the results are definitely satisfactory. If you have questions on how to replace your diaper’s elastic, feel free to ask in the comments. Mama’s Laundry Talk has a whole series dedicated to the washing and care of Cloth Diapers. Find all of those resources on Mama’s Cloth Diaper Care Page. « How Often Do You Wash Towels?